Press Release | Bonfiglioli Engineering S.r.l. Ferrara, Italy: –Bonfiglioli Engineering (BE) will bring its advanced range of leading-edge packaging testing and inspection solutions to one of America’s leading industry events, the annual PACKEXPO show in Chicago. 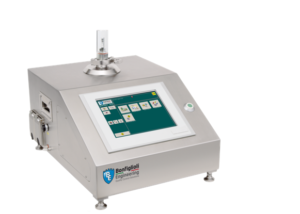 The Bonfiglioli Engineering stand at Booth S-1548 in South Building at McCormick Place will display the company’s impressive portfolio of solutions for container closure integrity testing, visual inspection and headspace gas analysis and complementary technologies. 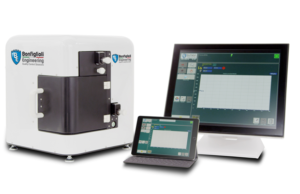 A star of the show will be the LF-S11 offline CFR21 compliant container closure integrity tester, purpose designed for quality control of pharmaceutical containers such as: pre-filled syringes, pouches, PFS nests, Monobloc, IV Bags, flow-wrapped devices, form fill seal and bow fill seal containers, carpules, bottles, ampoules and liquid form sachets. Also given live demonstrations at the show will be Bonfiglioli’s popular Lasercube benchtop Headspace Gas Analysis (HGA) machine for measuring the headspace level of gases, such as oxygen and carbon dioxide, as well as monitoring moisture levels in ampoules, vials up to 250 ml, cartridges and pre-filled syringes. With high levels of accuracy and stability, even in a limited headspace, the LaserCube is designed to meet the stringent regulatory requirements of the pharmaceutical industry. The unit also boasts a lightweight and compact design that is easy to use and set up via integrated PC and any wireless touchscreen tablet as the user interface. “We are very happy to be returning to PACK EXPO,” commented Mr. Piero Polastri, Bonfiglioli’s Business Development Manager- for North and Latin America. “As previous editions of this show have proved, PACK EXPO International remains the perfect platform for us to showcase our latest technologies and innovations to an influential Pan-American audience”, he explained. “We will be reaching out to an expert audience of key decision makers involved in Quality Assurance, production, maintenance, production and laboratory operations,” added Mr. Polastri. “These professionals care about high leak detection sensitivity; fast and repeatable test results, non-invasive and non-destructive test methods. All of these concerns we can meet,” he declared. Founded in 1974 and located in Ferrara, Italy, Bonfiglioli Engineering (BE) has more than 40 years’ experience of planning and manufacturing innovation that has made it a worldwide leader in the market of quality control solutions. BE provides products and services that exceed user expectations, thanks to its efficient organization, its widespread sales and technical assistance network, its consistent after-sale service, earning it the genuine trust of its loyal customers. With over 5000 installations around the world, BE serves a truly global customer base, making a dramatic impact on the efficiency and the safety of the packaging industry worldwide. The company owns its growth and success to the energy and vision of its founder Giuseppe Bonfiglioli. Throughout its history, BE’s core strength has always been in combining advanced engineering skills with innovative technological developments to create superior Quality Control Solutions. BE inspection applications, based upon the state-of-the-art proprietary technologies in Container Closure Integrity Testing, Visual Inspection and Headspace Gas Analysis are present in Pharmaceutical, Food & Beverage, Metal Can & Aerosol and Plastic packaging industries. These solutions are suitable for 100% in-line testing at high production speeds without altering the container features. Testing is quick, reliable and repeatable, and gives consistent results for a comprehensive batch control. The annual PACK EXPO and the co-located Pharma EXPO together form of the world’s most important trade fairs for the advanced packing and processing industries, attracting more buyers from the USA than any other sector event. Last fall’s show, in Las Vegas, attracted more than 50,000 international visitors from 130 different countries worldwide, along with more than 1,800 exhibiting companies. The EXPO events are jointly presented by PMMI, The Association for Packaging and Processing Technologies, along with the International Society for Pharmaceutical Engineering (ISPE). More information at: https://www.packexpointernational.com/. Click on BE at PACK EXPO 2018 for other information. Click on Bonfiglioli Engineering to contact the company directly. Click on LF-S11 for downloadable brochure. Click on LASERCUBE for downloadable brochure.